Only a tiny handful of official bottlings have been released in the last twenty-five years, ranging from a five year-old in the 1980s to a cask-strength 15yo bottled recently for sale at the distillery. Although the production is relatively rare you can find independant bottlings for sale. 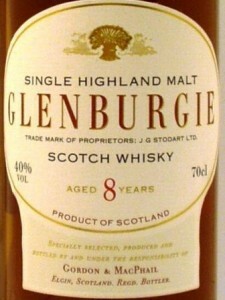 Glenburgie certainly isn’t the most famous Single Malt Scotch Whisky but one for people who can see past notoriety.